A simple life is definitely a life of hard work. A little elbow grease and the reward is totally worth it. Everything we do is done with purpose. I try to only do the dishes once a day to conserve water, and if you know me a sink with dishes in it drives me nuts. But around here water is gold. I have started baking our bread as to not spend unnecessary money. More work? Yes, but the ending result is better than any store bought bread. I also estimate that one batch that makes two 2 lb. loaves cost about $1.50-2.00 and bread here is $3.00-8.00 per loaf. Not only bread, but I make every meal on the boat which saves a ton of money on eating out. Once the boys start catching some fish we will almost be self sufficient. Which reminds me the local neighbors of the marina have come by every night and morning to make sure everything is okay and we have everything we need. One in particular, Finley, will be taking us out to catch some conch and show us how to cook it. This morning he showed us how to gut, fillet, steak, and marinate a barracuda. We will be frying it up tomorrow with the other neighbors. He also plays in a band and has invited us to go see his show on New Year's Eve. When I do the laundry it is done with as little water and detergent as possible. I have found that my clothes smell better and are more fresh washed by hand. It could also be the fresh, non polluted air that dries them. Another thing we do a little differently is the use of paper towels. They are definitely a luxury and rags are used more on our boat. This makes for more laundry, but less garbage and garbage is hard to get rid of unless you are tied to a marina. We wake when the sun comes up and find ourselves tired at around 8:00pm. This is very unusual for us. I have never considered myself a morning person and have always stayed up till around midnight. Last night we had to put a hold on our game of gin rummy as we were too tired to play another round. 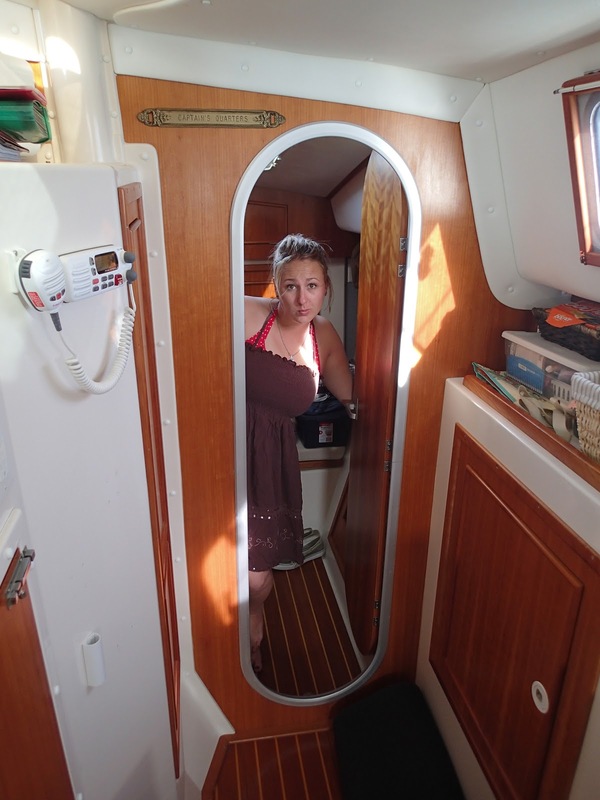 There are a few small items I sill am trying to find a place for on the boat, but other than that we are adjusting fairly easily to the small space. Wow! What an awesome adventure. Looks like you guys are doing great. Loved the pic of Layla in the sand and Preston and Dan in the Ocean. Looks so beautiful! Happy people are watching out for you guys. Have a great New Years!! Hopefully more beach days ahead and less problem days. Hope you had a GREAT Christmas and New Year. Nice conch!! Thanks for talking to Sam for a few minutes today. Made all of our day. I'll be stopping by for some bread later today...Looks delicious. I will make a fresh loaf when you are coming to visit!